Canada Celebrates Spring with Daylilies! 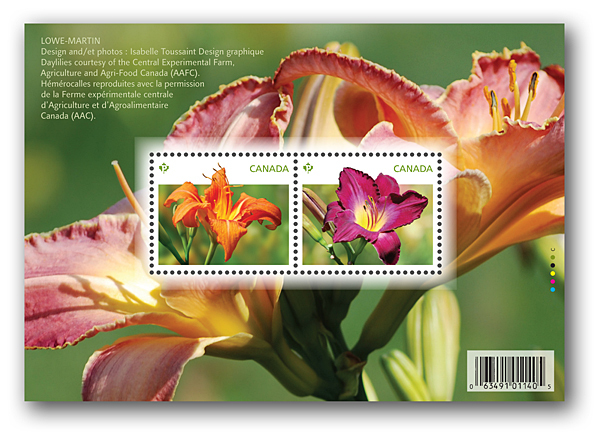 You are here: Home / New Stamp issues / Canada Celebrates Spring with Daylilies! I am usually unimpressed with Canadian definitive stamps, including the flowers series. But this year is different. I love the new Daylilies. Really colorful. These stamps are available in booklets of 10, mini sheets, FDC and Coil of 50 stamps. You can order them from Canada Post here: Daililies issue. Don’t you just hate those bar codes on minisheets? I have seen that on all new France souvenir sheets issue, and now Canada too. Ugly is all I have to say.